After Meredith Palmer, left, Brooke Bennett, Lauren Boatright, and Kelsey Berkel met in professor Robin Roberts's fall 2014 Representations of New Orleans course, the quartet achieved a rare and notable accomplishment for undergraduates. 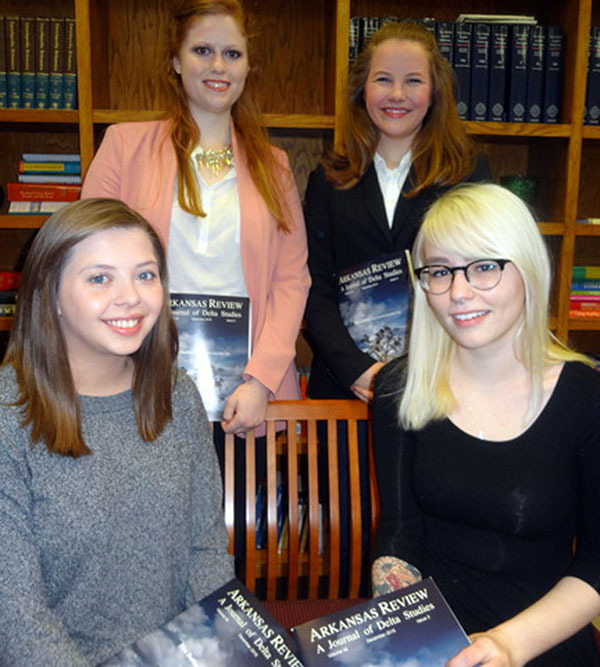 With Roberts' encouragement, all four presented their academic work at The 21st Delta Symposium, themed "The South Goes to the Movies," and subsequently were published in the December 2015 issue of the Arkansas Review. When they signed up for English professor Robin Roberts' Representations of New Orleans course, Kelsey Berkel, Brooke Bennett, Lauren Boatright and Meredith Palmer didn't know each other. They also didn't know that this course would lead them to achieve one of the hallmarks of professional success in English studies: A conference presentation and subsequent publication. But these students, all undergraduates in the J. William Fulbright College of Arts and Sciences, did know they would have to work hard, research their subjects extensively, and – perhaps most importantly – write and rewrite their essays to exacting standards. "It's rare for undergraduates to publish in a journal like the Arkansas Review, but these students exemplified the English Department's commitment to research and excellence," said Roberts, who mentored the group and guided them through the process. The quartet's shared adventure began after Roberts received the call for papers for The 21st Delta Symposium, themed "The South Goes to the Movies." She had an essay ready for submission, but when symposium organizer Dr. Gregory Hansen asked about graduate student submissions, Roberts told him she had something even better – four outstanding undergraduates whose work on New Orleans was first-rate. So she asked if he would consider their papers for the conference. "Four academic abstracts later, and their panel 'Mediated Imagery and New Orleans' was accepted," said Roberts, who then met with the students to practice reading their papers and discuss what the conference experience would be like. Roberts said each student had a different reason for being interested in New Orleans and her course. Berkel was drawn to the combination of literature with television and film to form a three-dimensional portrait of the city, while Bennett signed up because the course's emphasis on gender studies and television studies aligned with two of her academic interests. Boatright visited New Orleans often and her parents recently participated in the Mardi Gras parade that was her essay's focus, while Palmer visited New Orleans during high school and wanted to learn more about the post-Katrina city after falling in love with its culture. At the symposium, Marcus Tribbett, a professor at host-institution Arkansas State University, introduced the Fulbright College group. The well-attended panel sparked lively conversation and prompted Tribbett, who is also the editor of the Arkansas Review, to ask Roberts to submit their papers for evaluation for publication. "Once again, the students eagerly agreed to take on the extra work, including careful revision of their papers," said Roberts, who wrote an introduction for the section after the papers were accepted for publication. Then, in January - more than a year after their course had concluded - Berkel, Bennett, Boatright, and Palmer finally saw their work in print. Roberts said their experiences presenting and publishing have already helped each student professionally. Berkel is now enrolled in a graduate program in French, Bennett has been accepted in multiple M.A. programs in film and communication, and Boatright and Palmer have both applied to Master's in Teaching programs. "The students' excellence as researchers and their hard work as writers have gained them recognition through their publication," Roberts said. "At the same time, their success shows there is no limit to what Fulbright College undergraduates can achieve."